Making predictions about social trends of any kind is extremely difficult and arguably impossible. Past efforts at prediction have been notoriously unsuccessful, as Dan Gardner has shown compellingly in his recent book Future Babble. In my opinion we just do not understand war and international relations well enough to predict anything twenty years into the future. Certainly if the trends of recent decades continue, the coming decades will be more peaceful. But that’s an “if.” There’s no guarantee that recent trends will continue. Nonetheless, by recognizing recent trends away from war we can craft policies based on past successes, such as increasing support for the United Nations. I’d like to address one common fear about war in the coming decades – the rise of China relative to the United States. Political scientist and leading “realist” John Mearsheimer (2010: 382) has written that “to put it bluntly: China cannot rise peacefully.” My view, by contrast, is that a great-power war involving China is possible alright, but not inevitable and actually not even that likely. Must a rising China inevitably come to blows with the United States as the former hegemonic power in decline? The analogy is to the rise of Germany and the challenge it posed to Britain before the World Wars. But China, unlike 19th-century Germany, follows a “peaceful rise” strategy and has not fought a single military battle in 25 years (the only permanent UN Security Council member in that category). Also Germany felt denied its due status in the international system, as it came late to the colonial game and had few overseas possessions. But China has its due status as a permanent veto-wielding member of the UNSC, thanks to the foresight of Franklin D. Roosevelt in the creation of the UN, back when China’s power was anything but great. China’s leaders stay in power by delivering economic prosperity based on international trade. A future war against the United States or another great power would wreck the pursuit of this trade-based wealth. That would be irrational on the part of China’s leadership, which has so far proven both peaceful and generally rather cautious in world affairs. Given that a great-power war in the nuclear age would be absolutely catastrophic for the participants, one would have to assume a level of craziness or stupidity from China’s leaders that completely departs from their behavior in recent decades. They may be exasperating as negotiating partners, or brutal as human-rights abusers, but they are not crazy. The most dangerous possibility of war would involve an accidental or unintended escalation of a U.S.-Chinese conflict over Taiwan. The American position is deliberately ambiguous about whether the United States would come to Taiwan’s defense in the event China attacked to re-integrate the island by force. The United States has for decades officially recognized that Taiwan is part of “one China,” and does not recognize Taiwan as an independent country. At the same time, however, the United States sells arms to Taiwan and implies that it might use military means to prevent forceful re-integration. Fortunately, China-Taiwan trade and communication have been increasingly rapidly, and the chances of a declaration of independence, or some other reason for a Chinese attack, are decreasing. As for the South China Sea, the conflicts there are worrisome but so far have tended to produce calibrated ballets of diplomatic and military maneuvering rather than conquest by force. The stakes in oil and minerals undersea in that area may be lucrative, but they in no way would outweigh the enormous costs of international wars in the region. Mistakes could happen, trends could shift, things could go badly. But it would be wrong to think of negative outcomes as inevitable, or unstoppable. All evidence suggests that sound policy choices have good prospects to steer U.S.-Chinese relations, as well as those among other great powers, away from war in the coming years. Joshua S. Goldstein is professor emeritus of international relations at American University and research scholar at University of Massachusetts, Amherst. His book Winning the War on War: The Decline of Armed Conflict Worldwide (2011) documents the reduction in the number, size and scope of the world’s wars in recent decades. It is just a matter of time before Japan will be targeted by North Korean nuclear-armed ballistic missiles. Japan was targeted by Soviet nuclear weapons in the Cold War and, possibly, faces a similar threat from Russia and China today. So nuclear weapons proliferation is far from a new issue for Japan; however, if such proliferation expands to other regional nations, this will be serious problem. Will the Long Peace Persist? We live during an era of historically unprecedented peace. 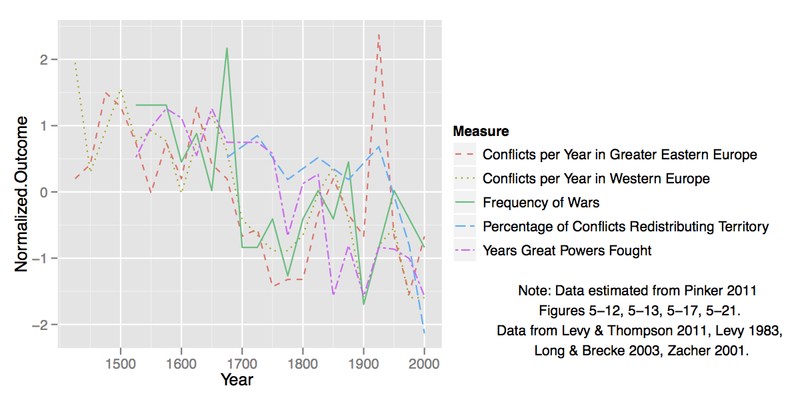 Whether we look over timescales of decades or centuries, wars have become less frequent. Figure 1 (data drawn from Pinker’s excellent new book, original sources include here and here) illustrates the downward trend in five measures. There are fewer Great Power wars, fewer wars in Western Europe, fewer years during which a Great Power war is ongoing, and less redistribution of territory after wars. Other trends, not as readily quantified, are evident. Countries no longer covet each other’s territory, or fear invasion and military coercion, like they have throughout most of history. National identities and aspirations are based less on martial glory, honor, and dominance. The relative absence of war, and especially Great Power war, since the end of WWII has been referred to as the Long Peace. As unbelievable as it may seem to readers of history, these and other trends suggest to many scholars that the Long Peace is likely to persist. But unlike the robust decline in interpersonal and domestic governmental violence (again, see Pinker), it is not as obvious that the human costs of war have declined over time. 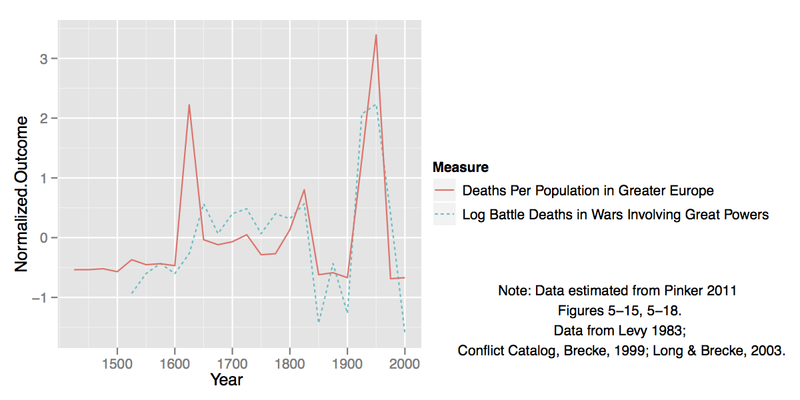 Figure 2 illustrates two other important measures that don’t show a decline: except for the most recent few decades, battle deaths in Great Power wars and battle deaths as a proportion of population in Europe don’t show an obvious decrease. While recent decades do seem particularly peaceful given these long-term trends, we would hardly want to be complacent about this trend. Many previous decade-long spans of peace ended in devastating wars. It may be, then, that wars have become vastly more destructive, especially with the invention of nuclear weapons, leading countries to be more cautious about their use of military coercion. The net costs of war on humanity, however, may not have decreased. The Cuban Missile Crisis ended with little bloodshed; however, it could have ended with hundreds of millions of deaths. Such a counterfactual would add a massive spike to the right end of the lines in Figure 2, and mute any discussion of a Long Peace. Aggregate data like the above gives us some, but not a lot, of confidence that the world has moved beyond war. To probe the persistence of this Long Peace, it would be helpful to know what factors have made the world more peaceful, and the extent to which these factors are likely to persist into the future. Potential causes of the peace include increases in trade, democracy, the difficulty of coercing wealth, global empathy, Great Power stability, the empowerment of women, and the deterrent effects of nuclear weapons. Global Trends 2030 identifies a number of other factors pertinent to the future probability of war, including power transitions, declining US military superiority, resource scarcity, new coercive technologies (such as cyberweapons, precision-strike capability, and bioweapons), and unresolved regional conflicts. Wars are rare, but when they occur they alter the course of history. Any projection of what the world will be like decades into the future needs to evaluate the probability and character of war, and especially Great Power war. This week we can look forward to a set of eminent scholars sharing their thoughts about whether the Long Peace will persist. Contributors include: Erik Gartzke, (UC San Diego),Benjamin Fordham (Binghamton), Joshua Goldstein (American), Steven Pinker (Harvard), Jack S. Levy(Rutgers), Richard Rosecrance (Harvard), Bradley Thayer (Baylor), and William Thompson (Indiana). Allan Dafoe is Assistant Professor of Political Science at Yale University. His research examines the causes of war, with emphases on the character and causes of the liberal peace, reputational phenomena such as honor and tests of resolve, and escalation dynamics. Pinker, S. 2011. The Better Angels of Our Nature: Why Violence Has Declined. Penguin Group. Levy, J. S., & Thompson, W. R. 2011. The Arc of War: Origins, Escalation, and Transformation. Chicago: University of Chicago Press. Levy, J. S. 1983. War in the Modern Great Power System 1495–1975. Lexington: University Press of Kentucky. Long, W. J., & Brecke, P. 2003. War and Reconciliation: Reason and Emotion in Conflict Resolution. Cambridge, Mass. : MIT Press. Zacher, M. W. 2001. The Territorial Integrity Norm: International Boundaries and the Use of Force. International Organization, 55, 215-250. Begin Your Search Ask family and friends if someone who does is known by them or should they require a spot to stay. If so, I hope you’ll read melanie’s slice and then use it as a springboard to write about a online college homework help similar personal experience. Consider utilizing the solutions of a background-check organization that is criminal that is online. Produce a Rental Agreement In writing, positioning your arrangement gives protection in case there is turmoil that is personal or authorized. In case you market, contain fundamental information regarding the area you have not unavailable, any deal-breakers and your neighborhood, for example smoking. Other activities to take into account are the tenants use of your kitchen along with other areas in the home, house peaceful hours custom essay writing service reviews and whether you’ll present storage or possibly a parking place. custom essay writing service reviews The agreement also needs to include “home rules” regarding family tasks disturbance and overnight guests. Next, possess the individuals practice discussions that are simple in groups.